VISITORS faced travel misery into Portsmouth as traffic clogged the roads. 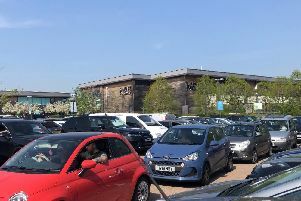 Hundreds of people were hit with lengthy delays on Bank Holiday Monday as people attempted to head into the city. Most of the congestion centralised around the M275 gateway into the city centre, with roads to Gunwharf Quays also jam-packed bumper to bumper. Bus routes had to be diverted, with slower services running across the city for travellers. Bus operator Stagecoach was yesterday forced to apologise to customers for ‘major delays’ on its 700 route to and from Portsmouth.